As I was on a mission yesterday to find chicken livers for the pate`, I decided to purchase a bit more so I could prepare chicken liver salad. The first time I had Chicken liver salad it was on the South of France in a tiny little bistro. As soon as I took the first bite I was in love and needed to have the recipe. Of course the bistro chef was most kind to share, however did not share with me the measurements. With the ingredients that I was given it was easy to replicate the great flavor that made me enjoy the salad so much in the first place. Light dinner full of flavor. Sauté` the onion and the bacon with the olive oil in a large skillet, over medium high heat. When the bacon is slightly crisp add the chicken livers. Stir well. Add the balsamic vinegar and continue to cook slowly. Add more vinegar if necessary. 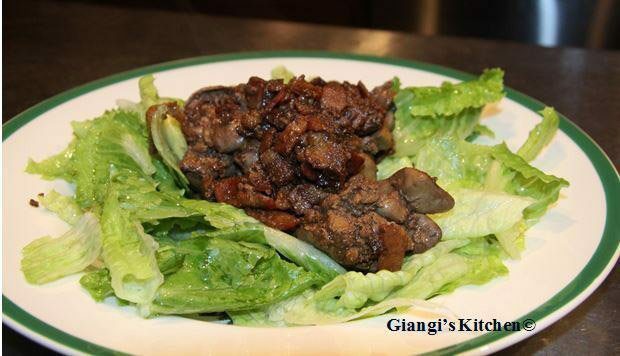 Serve warm over a bed of lettuce.